VHT Flame Proof Paint Coating was originally developed some 30 years ago and is now used as a protective paint coating for the white-hot surfaces of space-bound and re-entry vehicles. Since its inception, numerous industrial, automotive, and electrical engineers have developed new ideas for applications of VHT flameproof paint. These include aerospace hardware, smoke stacks, jet engines, heat exchangers, boilers, heaters, exhaust manifolds, mufflers, steam pipes, barbecues, electrical hardware, and countless other applications where resistance to high temperatures and/or weathering is required. Flame Proof Paint Application: Apply a THIN, even coat of VHT FlameProof Paint - just enough to thoroughly COLOR. Excessive build-up is not necessary or recommended. In applications requiring heavy coating, build-up should be done in stages, each successive coat being cured as recommended below. Nominal coating wet thickness .0015'' - .002''. VHT FlameProof paint coatings require no primer. For most economical use of VHT FlameProof colors on ''hard to hide'' surfaces, apply a thin coat of VHT FlameProof White or VHT FlameProof Silver base coating. On non-traffic surfaces and where solvent resistance is not required, VHT FlameProof coatings may be used as air-dried. Curing may be accomplished by the inherent heat of operation such as encountered in engine manifolds and exhausts, boilers, heaters, etc. or by following the curing instructions below. 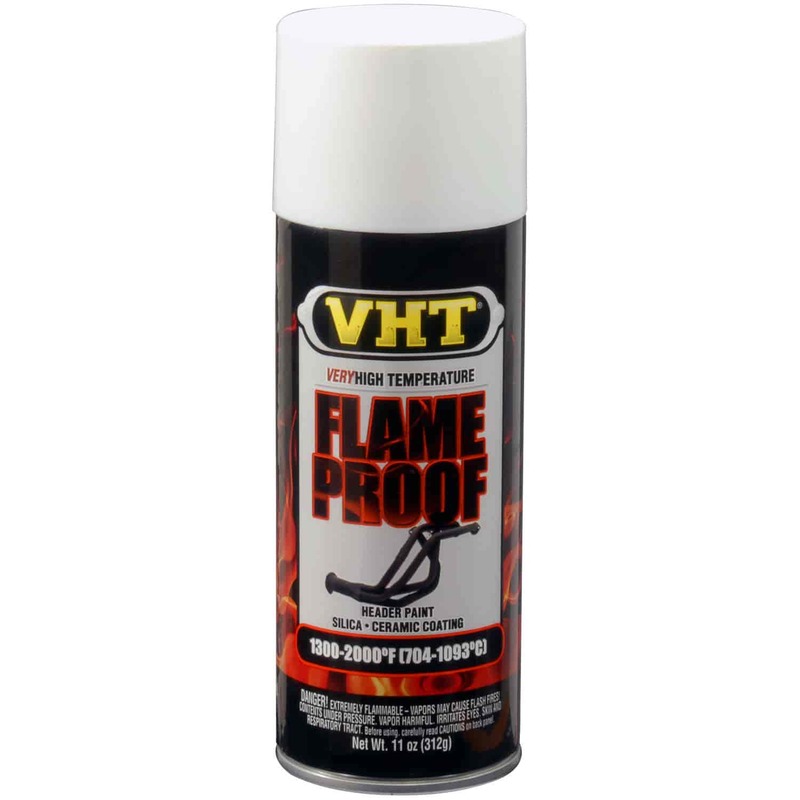 Curing VHT FlameProof™ Coating only attains its unique properties after correct curing (refer to instructions on the can).